Boy, if you don’t like this cake, I don’t know what to say! A bonus…it’s super easy to make. Once again, I started with a basic cake mix. Years ago, I found a recipe for a cinnamon coffee cake that was a bit time consuming to pull together. It tasted great so I continued to make it for the family. Then, a couple of years ago, I found a similar (but easier) recipe in the newspaper and tucked it away for another day. 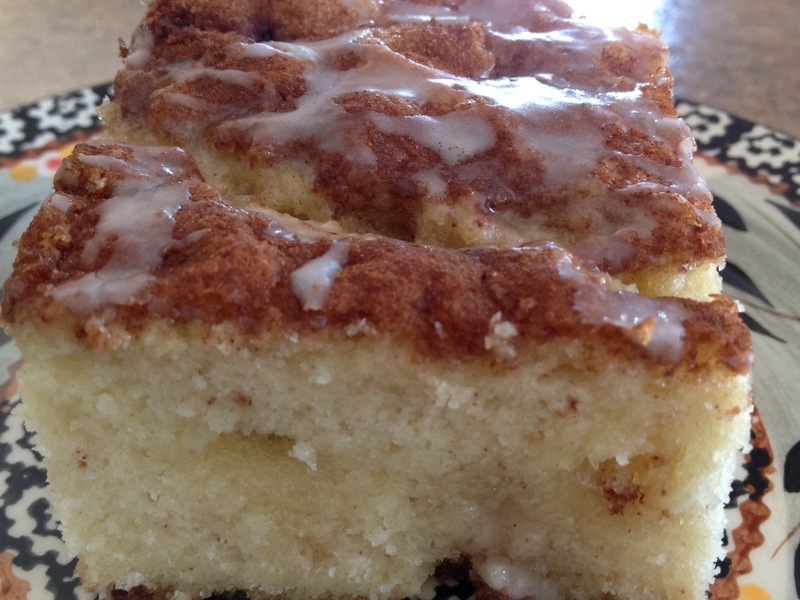 Yesterday, I had a taste for my original cinnamon coffee cake recipe. While looking through my recipe binder, I found the page ripped from the newspaper that I had tucked away some time ago. I thought…why not give it a try? After altering the recipe a bit, I quickly mixed it up and threw it in the oven. Well, the smell of the cinnamon and extracts was enough to make me salivate in front of the oven, as I watched the cake rise and take shape. Mmmmm, it sure smelled wonderful! And, after letting it cool and giving it a taste, I was not disappointed! This sweet, moist, cinnamon roll coffee cake is absolutely delicious! Prepare cake mix as directed on the package. Add extracts to the batter and mix well. Spray, with cooking spray, a 13×9″ baking dish. In a separate bowl, mix together the topping ingredients. Pour half of the batter in the baking dish. Sprinkle half of the topping mixture over the batter. Pour on the remaining batter and finish by adding the remaining topping. Swirl through the cake mix with a knife. Bake according to package directions. Cool and top with my powdered sugar icing. Yummy! This cake lasted approximately 3 hours on the kitchen counter. Every time I traveled through the kitchen another piece was missing! This is a fabulous cake recipe. thanks for the comment and for visiting my blog! bahaa i can see that happening in my house, except there are only two of us and i would eat 75%! i’m making this asap!